If you have seen the phrase Forex trading at some point maybe you have wondered whether it is something that might interest you. Understanding what Forex trading is all about becomes a bit easier when we realize that Forex stands for Foreign Exchange. Forex trading is therefore all about buying and selling different currencies in order to make a profit. For example, you could buy US Dollars while selling Euros at the same time. You would be speculating on the future changes to the cost of each currency by buying one while selling other. Of course, current rates rise and fall all the time due to many different factors. When you open a Forex trading account and take part in Forex trading you are trying to make money by working out which currency is likely to increase in value and which is more liable to fall in value. This sort of foreign exchange trading can be carried out on a 24 hour basis. Unlike in the world of stock markets, there is no central location or main exchange where the deals are registered or carried out. The reason that trading can be done around the clock is because it is a global market. Australia and New Zealand start the ball rolling each day, followed by Asia and then Europe, with North America closing out the day. The fact that people trade currencies all throughout the day means that there is no significant risk of big price jumps in the way in which shares sometimes shoot up or come crashing down when the markets open. Of course, when you buy and sell foreign exchange there is a bigger possibility of making or losing money than with many other types of market trading. To make the transaction you don’t need to buy all of the currency up front, though. All you need to do is put down an amount that covers a relatively small percentage of the overall trade. To work out the potential profit from each deal it is necessary to know the relative value of each currency. 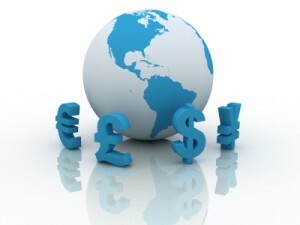 This comes in the form of the base and counter values that are applied to each different pair of currencies. For instance, the Euro vs. US Dollar pairing has the Euro as the base and the Dollar as the counter. In this case, when the price falls is would be because the Dollar is strengthening while the Euro is getting weaker. What this means is that you would want to buy a currency pair when you believe that it is most likely that the base currency would get stronger when compared to its counter equivalent. Of course, this also means that if you think that the base currency will be the one to weaken then you would want to sell this pair rather than buy any more. The currency pairs are generally quoted with a price that runs to 5 decimal places. When the 4th decimal place has some sort of change to it then this is called a Pip (Percentage in Points). Changes can then be quoted according to the number of Pips that they have moved by. When you hear someone talking about the spread they are discussing the difference that exists between the BID price and the ASK price of any currency pair. This can be quoted in Pips using the formula we just looked at. So, a price of 1.43000/1.43006 would have a spread of .06 Pips. Will you make a fortune on Forex trading or is it something you aren’t keen on trying? Maybe you have had a good or bad experience that you could share with us? 4 Responses to What is Forex Trading? I have no experience with Forex trading, but I’m glad to have learned a bit about it through your post! I will not be diving into investing (beyond retirement) until I’m out of student loan debt, so this will go in my memory bank for later! Before I started working in insurance, I tried to be a forex trader. It’s A LOT of work, and I quickly realized there were a ton of smart people working behind the scenes. It was fun, but I couldn’t take the stress of trading on a daily basis. You can make (and lose) a lot of money in a few minutes. There are some pretty funny videos on YouTube of people making big gains and losses.